There seems to be no end to the pundits' fascination with the Falcons, and yet again this preseason, we saw the comprehensive crowning of a paper champion. As has become rote with the Smith/Ryan Falcons, when the big moments arrive, the Falcons shrivel up and lose. We've seen it again and again and again and again and again and again, and we saw it yesterday too. 3-12 is the mark of a footstool, not a champion. If the Falcons are so intent on being the best team in the league, then they should first worry about being the best team in their own division. Too bad all those experts don't recognize this. Until that happens, the Falcons will be little more than the not-quite-good-enough team they've repeatedly proved themselves to be. 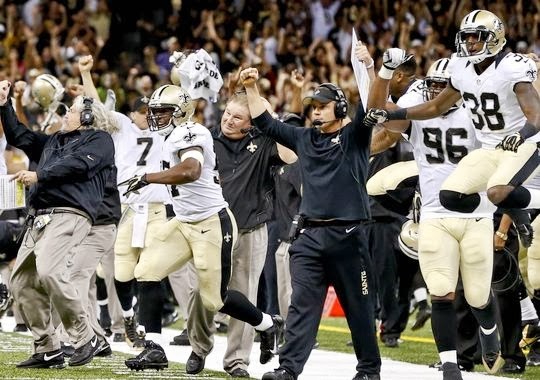 As for the game itself, the most lasting impression was Sean Payton's trust in his new defense. The key moment came on 4th and two from the Falcons' four-yard line, with 3:16 remaining, and the Saints holding a three-point lead. Instead of going for the touchdown and effectively icing the game, Payton opted to kick a field goal and play defense. Think about that for a second. Payton bypassed the chance to put the game away with his offense, and instead attempted to win it with his defense. To me, this was a rather shocking decision especially in light of Payton's history of aggressiveness. Added to that, had the Saints gone for it and failed, the Falcons would have faced 96 yards to win and 60+ yards to tie. With all that added up, I was certain Payton would go for it. What it amounted to was Payton trusting his defense more than he trusted his offense's ability to execute a two-yard play. It was weird, and seemingly out of character. And as it turns out, it was the right move. Just barely, but right nonetheless (mind you, I am not complaining here). "Just barely" works every time as far as I'm concerned. Of course, this is the reason Sean Payton is who he is: because he has a knack for the making the right choices at the right times. This time, it was trusting his defense and, more than that, it was an attempt to build a team that can win games when the offense isn't at its best. Aside from just being a message of confidence sent to his defense--that he trusts them to close the deal--this might be indicative of a bigger shift within the Saints' overall philosophy. For Payton to make a decision like this (in a close game against his division rival) is noteworthy. In a league that's become increasingly spread-oriented and wide open--a large part of that embraced and pioneered by Sean Payton--yesterday's installment of the Saints looked fairly conventional. Maybe that was just the residue of the game planning, or maybe Payton believes a more traditional style is the best way to properly compete in the NFC this year. Only time will tell, but it's worth monitoring. In a similar vein, as has been mentioned frequently, Drew Brees didn't play his best game yesterday. By no means was it a poor performance, but we saw Brees miss throws that he's otherwise made effortlessly in years' past. While I don't think this is anything to fret over, and while I still have the ultimate confidence in Brees, there's a larger point to see here. At some point, and we might already be there, a disproportionate reliance on Brees will hamper the Saints' Super Bowl aspirations. Maybe that's always been the case, and I've just been a bit fooled by his stratospheric numbers. But one way or the other, if the Saints intend on winning another Super Bowl, it's going to take a well-rounded team that's competent in all phases of the game (duh). An over-dependence on the offense, largely on the shoulders of Brees, might be enough to win ten games or so, but is it enough to win another Super Bowl? And you know, that's what this is all about. When we listen to Sean Payton talk about an increased focus on improving the running game and the defense, he's saying, in so many words, that it takes more than just Brees and the passing game to be optimally competitive. And while he can say this all he wants, what really matters is what happens on the field each week. In other words, will these stated intentions from Payton translate into his game plans? In my opinion, that's what's going on here: a shift in the deeply-rooted Paytonian strategy to something (partly) new. Though we're not exactly sure how Payton will approach the 2013 schedule in whole, we have some clues after one game. If that's indicative of what's to come, this might be a completely "new" Sean Payton after all. Sean had a year to sit back and watch the team. He saw that no running game=predictable. I think he has always know this inside, but last year it was so blatant, he just can't ignore it anymore. Jari was absolutely horrible - anomoly. Drew underthrew 3 significant passes, at least 1 possible TD - anomoly. Hogs run blocking looks average at best. Pierre needs more snaps.Thats ok!